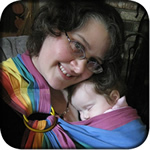 If you have a sleeping baby productions sling and have been enjoying it, please send me your testimonial! Also see my reviews on the BabyWearer, and check out this thread! "Let me start by saying you are crazy fast! Like ninja fast, and for that I thank you. I am definitely a package stalker but this I barely had a change to think again and it was shipped and on its way. When I received my sling, the packaging was simple and to the point yet so neat and cute, just like I like it, I ordered my sling in Sangria. I made the right choice; The color is so lush. I washed and hung to dry per your instructions and the next morning I put it to work. The sling is awesome my 20lb 7 month old feels weightless and I just love the simple neat look of it. It's my go to now. I had a padded Maya right before purchasing yours but padding wasn't for me, it didn't spread easy and dug into my neck like crazy. I will continue to rave about you in BWing groups and recommend you everywhere. Can't wait to purchase more of my own in different shoulders and fabrics and all my prego friends will receive slings or your gift certificate. I think they'll love them just as much as I do." c.w. "Dear Jan - I bought a solarveil sling from you a few years ago, and now with baby #2 it is our go to workhorse sling. I just wanted to write and let you know how many compliments I get on the sling. Lots and lots of people have asked where I got it, and I'm glad to be able to send them to you, even if the particular fabric is not available anymore." c.p. "I already received the sling a few days ago, and have been enjoying it ever since! It's a great treat to have the wonderful Maya wrap fabric with your shoulder design. It's very comfortable to wear. And it looks so sharp! People comment how well it fits me - they've mostly only seen bulky padded ring slings. And so many more people notice my baby and come up to admire him because he's at "eye level". I especially love the pretty stitching along the shoulder - it reminds me of a heartbeat." d.k. "Thank you for the speedy shipment of my midnight hemp silk + pocket. It is so soft for my 3 month old. The strip of shiny fabric on the pocket as well as the tail really looks sharp. You're right about it being good for dressy and casual occasions. I wore it the first day to the park w. my black lounge pants and jean jacket and totally rocked it! Your care and pride in your work really shows through in your slings. I also enjoyed the long ribbon strap to attach to the rings. The configurations abound, and it really helps w. hanging on to my keys." n.p. "We got our sling today and I am absolutely totally and completely in love, as is my daughter. One of my friends just had a baby and he wants to be carried all the time so I let her borrow my maya wrap. My daughter has been missing being carried, and she just got pink eye so she has been super clingy. No lie, I took our new ring sling out and she started clapping and immediately asked to go up. I put her in the hip carry and she snuggled right in happy as clam to be carried that way. She (and I) are much more comfortable with the extra width of the fabric. I am breaking it in well already, I carried her in it to my oldest daughters preschool and then we went grocery shopping with her in the back carry (again the extra width made that possible) and this afternoon we'll walk to go get my oldest from school in the sling again. Thank you a million times over I am so happy with my purchase. I still would love one of the rainbow wrap conversions as well (still saving money for that for the new little girl coming in June/July)." m.k.p. "I am in LOVE. The sling is so comfortable and sewn so well - everything is finished not serged and just beautiful. Jan was AMAZING to work with. She answered 101 questions and helped me find the right fabric. I had fallen in love with a silk charmeuse black and white daisy print and wanted black dupioni for the main fabric. The silk charmeuse is just on the end, not lined with dupioni, and it is so much fun to play with. I also couldn't make up my mind about a pocket - so she sewed this little bag with a zipper that can snap onto the rings. I love it. "Honestly though my favorite part is Bella's sling. She took as much care with that as she did with mine and it is too cute for words. Bella is thrilled to have a matching sling." h.s. "Thank you for making beautiful well-made slings that are affordable!!! We have a tight budget but I finally got my husband agree to making the purchase of a sling for our second child. The sling arrived quickly and I was so excited to use it. My 16 month old loves it but our newborn is IN LOVE with it. She is so snuggled and comfortable and it is very easy to nurse in (not like the Baby Bjorn!). With this sling I am able to hold/nurse her AND play with my toddler. Thanks again!" s.k. "I just wanted to let you know how much I am enjoying the pink solarveil sling you made for me a couple of weeks ago. It arrived very quickly. The Solarveil fabric isn't the most pleasant thing I've felt, but it improves greatly with even one washing. My mom purchased it for me for the heat and humidity of the summer and for use in the shower. My three month old really likes it and is even getting used to showering in it with me. I live in a very non-babywearing rural area, and I have been getting compliments every time I wear her in your ring sling. Normally, I get an occasional positive comment and many stares. I don't know if it's because your sling is so beautiful (it is) or if my daughter just looks even more beautiful in that shade of pink (she does). It's probably both. Your sling is more comfortable than the better known ring slings that I own. I can't tell you how pleased I am. I look forward to when I have the money to try another fabric from you. Thanks for the great job! One more thing, I really appreciate your instructions for making your own carriers. My mother made two MT-type carriers from instructions linked from your site." s.e. "I'd never used a baby carrier of any type, nor knew anyone that really did. I bought a Bjorn used, then later realized my summer baby would be too hot in it. I started reading about how good it is to wear babies and looking into different carriers. All the choices out there made it baffling. I finally determined I wanted something made of solarveil fabric. I Googled _solarveil baby sling_ and your site came up on the first page. After reading your site and realizing how local you are to me, I felt really good about ordering a sling from you. Seeing pictures of you at beaches I've probably been to and reading some of your personal pages (I love the grammar pet peeves) really made a human connection for me. I was due in a few weeks and ordered a color that you didn't have in stock. I figured I would get it eventually and it wasn't a big deal to wait. However, the sling arrived while I was in the hospital and was waiting for me when I got home with my new baby. I took my baby to his first doctor visit in it. Somewhere between the car and the waiting room, Jonah fell sound asleep. Later, my husband held a yard sale and I really wanted to take part and be outside and enjoy the day. I popped Jonah in the sling and he slept for 3 hours. The sling enabled me to shop, go for walks, get out and recover. It's been great!" l.b. "I have to convey how much I love my new ring sling! I had never heard of a ring sling prior to surfing the net for tips to get my 3-month old daughter, Katerina, to sleep. I stumbled on your website, fell in love with the thought of having Katerina close to my body without having to constantly support her weight with my arms, and ordered a pink cotton twill ring sling. It is phenomenal! She took to it instantly, and it was fantastic when taking our older children on vacation. Katerina slept in it for hours! She also enjoys the kangaroo position so much that we've nicknamed her Kateroo! The sling is totally comfortable and takes the weight off my arms which allow me to do so much. In addition, I can't tell you how many people have given me compliments on the attractiveness of the sling and how adorable my daughter looks in it! I can't wait to order another one for the autumn. Thanks so much!" l.c. "I purchased one of your slings last winter just before my 3rd baby arrived, and I never dreamed it would be so perfect for my baby, my family, and even my preK class at church! "Once the new baby came, my 18 mo demanded to be held even more, and my sling allowed me to carry her while tending the new baby and my 4 year old. This sling has helped me carry my two youngest; I have been able to say 'hold my tail' to my toddler and preschooler on outings to keep them close as we navigate parking lots and stores; and when I have more than one toddler in tow, I can use it as a leash for one and have the others help hold my sling. During VBS at church, my sling worked in a pinch for a 'rope' for the pre-K class to hold on to as we traveled from station to station through the evening and the rings on the end made it easy for me to hold on to while herding kids. I even had kids upset because they lost their grip and couldn’t hold on to the pretty rope! "Since then, my girls love to make a “baby” out of my sling and carry it for me in between uses, and I know that as long as I have my sling in hand, I have a quick blanket or an extra hand at my disposal. Thank you for such a wonderful product that has so many wonderful uses!!" l.s. "I just know a good product when I see it! I can't believe that you sell such lovely slings at such a great price. Your slings are perfect for beginning (and experienced) babywearers--they're attractive, comfortable, and well-priced." s.o. "I absolutely LOVE your slings. They are so comfortable and well made. Your shoulder pleat makes getting the sling on just right without bunching very easy and comfy. I love the long, open tail. I can use it to cover my daughter from the wind or sun or I can pull it up and make a little 'pillow' for her when she's sleeping. She loves to sleep in the sling. It's the only place she naps, really. Your slings should come with the warning that they are addictive . . . I just can't get enough of them or wear them enough. I get tons of compliments when I wear my daughter out shopping and have handed out lots of your cards! My solarveil sling was so much fun to have at the beach. I could take my baby into the water with me and the sling held her safe and kept her from the sun and dried so fast when we got out of the water. Thanks so much for all your help and for making my wonderful slings!!" l.b. "Hi there I just wanted you to know how much we love our new sling! It took some breaking in for the solarveil material and a switch to using a ring sling but it is now my favorite!" j.l. "Thank you for your beautiful handiwork. I can't say enough how impressed I am with the quality of your work. My sling is so much better than my [commercial padded] sling, I will never go back to using that one after having used the one you made. It is so much more comfortable and lightweight. The pocket is so convenient, I put everything in there, keys, wallet, toys, and a snack and juice box for my 2 year old." j.p.
"I just wanted to let you know that I received the sling yesterday. Dylan and I have already happily moved into it and we love it. The extra long tail is fabulous. We were outside shoveling yesterday, and the tail came in handy--I draped it over his little head to give him an extra layer against the wind. I know the sling is going to become an indispensable part of my wardrobe. Thanks soooo much." s.f. "all i can say is WOW wow wow, they are gorgeous! you did a great great job! that new reversible pleat you invented is pure genius. everything is so perfect and tidy, down to the padding in the shoulder (did you put padding in it or did you just arrange it perfectly?) ... wowee! ... they are so gorgeous i want to wear them all the time!! seriously, BRILLIANT and i cannot thank you enough! "i got stopped SO many times today in the [shopping center] with just the red solarveil, and my neighbor with new babe said he thinks it's the prettiest one! i gave out your site to a bunch of folks, so maybe you'll see a surge in orders from so cal! one woman couldn't believe how affordable you are, i told her you want to promote mommies slinging their babes! another woman followed me into a store to ask me about it." e.b. "I absolutely love this sling, as does Jason. He has been in it so much today, and since we got it. I don't know what it is, but he loves it. The fabric is lovely. I have a [name brand] (i am borrowing from a friend)and he won't stay in that anywhere near as long as this one. I adore it. Thanks so much for making it". r.d. "I received the sling yesterday and am extremely impressed by how beautiful and sturdy it is. Your sling instructions are also great for beginners... As a matter of fact, my baby has been sleeping in the sling for 2 hours!" l.c. "I received my sling on Friday. Thank you! It looks so great." c.m. "I just had a chance to try on your slings today, even though they arrived a few days back (just came back from a weeklong business trip). I really like the grey twill sling - the fabric is nice and soft as you mentioned. It took a bit of getting used to (since it is my first unpadded and open-tail sling) and several tries to get a good threading through the rings, but I'm slowly getting it, I think. DS even slept in it for almost an hour this afternoon! =) Anyway, I just wanted to say thanks a lot for the well-made slings and also for the lightning-fast turnaround time! Wishing you all the best on the upcoming baby." A follow up later: "Since we got your sling over a month ago, Sam has napped in it for 3-4 hours EVERY DAY (he's snoring loudly in it as I'm tying this). My wife has even dubbed it "his second crib". It is definitely the one sling that we won't leave home without!" p.w.